You’ve come to the right place if you’re looking for an iPad Repair Detroit. We fix broken and cracked iPad screens for fellow Detroiters. 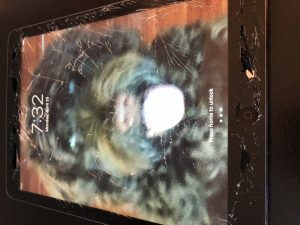 For nearly 8 years, we’ve been working with people who have shattered their iPad screens. Shelly rang us up this afternoon. She was in need of a new screen on her iPad Air. Apparently her son had taken a skateboard to it. Not actually bashing his skateboard into the iPad. But more like riding it in the house, falling off of it, and allowing the skateboard to go crashing into the iPad across the room. 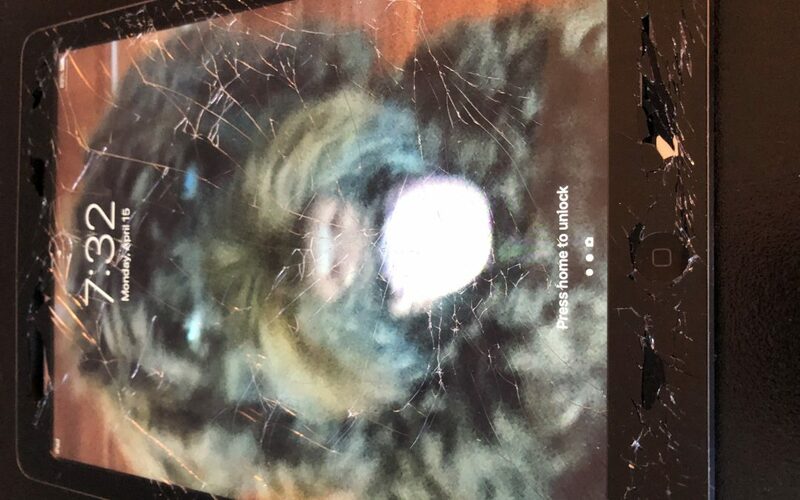 The result, unfortunately, was a cracked dog face (look at the picture of the cracked iPad screen). We set up an appointment to meet Shelly at her office in downtown Detroit. She set us up in one of the conference rooms and we got right to work. For iPad repair Detroit, we generally need about an hour to totally replace the cracked screen. If we do it at your home or office, we kindly request a large table or desk to work from. Sometimes with all those cracks, the glass can get a little messy. Anyways – we were able to get Shelly’s iPad Air looking like new again. The dog no longer had cracks and broken glass chips all over his face. When we were finished with the iPad, it looked like brand new again. Shelly was delighted and mentioned that she was probably going to keep it away from her son for a little bit. Those iPads can get expensive, especially if you have to repair it often. At this time, we should also mention the benefits of a case. A protective case can really save your iPad from cracking during a fall. If you do need a screen replacement, please check out our services at iRepairMotown.